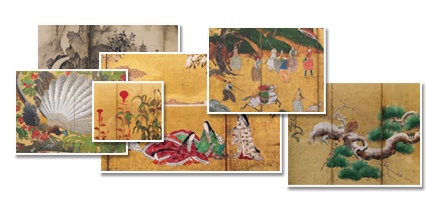 An ideal combination of function and beauty, Japanese folding screens, or byōbu ("wind wall"), have inspired generations of artists to create career-defining masterpieces; indeed, screens represent some of the highest accomplishments of Japanese painting. This exhibition showcases forty-one large scale examples from the esteemed collections of the Art Institute of Chicago and Saint Louis Art Museum, celebrating the full range of the format in various media including traditional paper and silk as well as stoneware and varnish. Artworks range in date from the late sixteenth century to daring works from the late twentieth century, demonstrating the longevity of this art form as well as its currency among modern-day artists.